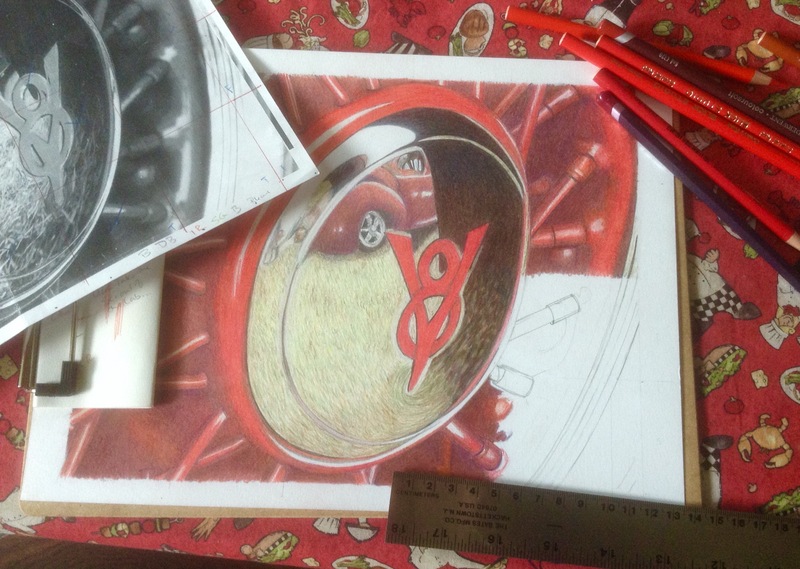 New Artwork: Red Car – Vrooom!! My art world has been a bit hectic lately as I attempt to get some new pieces ready for the Clackamas Arts Alliance’s Artist Exhibit Program. My most recent piece is the second in what should be a three-work series if the colored pencil gods treat me right. The first in the series was “Yellow Car” (which you’ll remember was the blue ribbon winner at the county fair, yeehaw!). 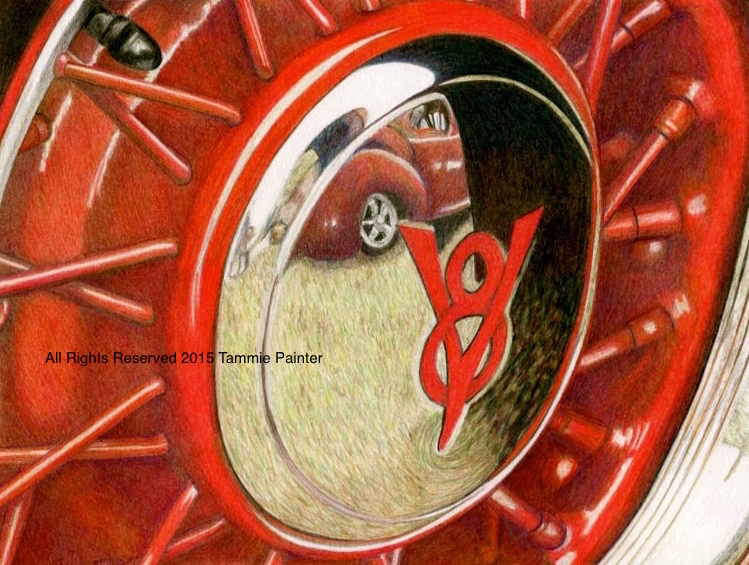 This second in the vintage car series is called “Red Car” (sorry, I’m not very clever with naming my art). I normally work on bristol paper because its surface has a nice smooth feel that still allows me put down loads of layers of color and lets me work in all that detail I obsess over in my drawings (I’ll occasionally use heavy weight drawing paper if I need a bit of texture). I’d been using (and loving) Blick’s Smooth Bristol, but the pad was getting low so I thought I’d give the pad of Canson Bristol I had on hand a try. Frustration set in rather quickly. The paper wouldn’t take very many layers making it hard to build up the depth of color I needed, especially in the darker areas of the image…and there were a lot of dark areas. Dark isn’t easy to do, it takes layer upon layer of different colors to give a rich dark appearance, and this paper just wasn’t letting me do it. Then, when I went to blend the colors, the paper nearly tore through. ARGHHH!!! 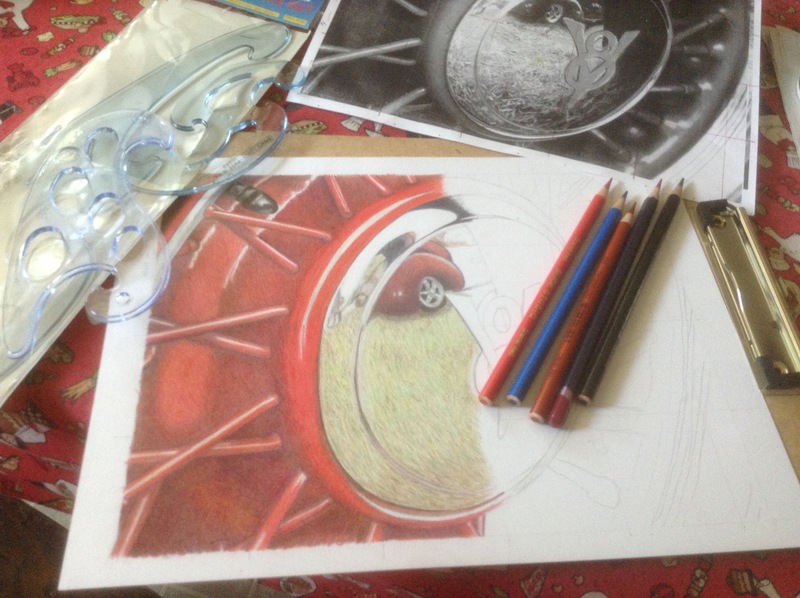 Let’s just say “Red Car” tested my colored pencil skills in new ways. Why not just start over? That would be the logical thing to do, right? To start over with the paper I prefer? Well, I’m stubborn and I’d put in a fair amount of time on the line drawing for the piece. I’d already invested about 3 hours into the piece at this point so I was not about to be thwarted by some damn fussy paper! I did eventually get used to working with the paper. I figured out how to build up the layers and how to blend them without killing the paper and, square by 2-inch square, the image starting taking shape. Struts? Spokes? Bolts? Nuts? What IS this?? Another challenge: the reflection in the chrome. “Yellow Car” shows plenty of reflective surfaces, but these reflections are kind of vague and were pretty easy to wing my way through (because, really, I’ve no idea what I’m doing half the time). 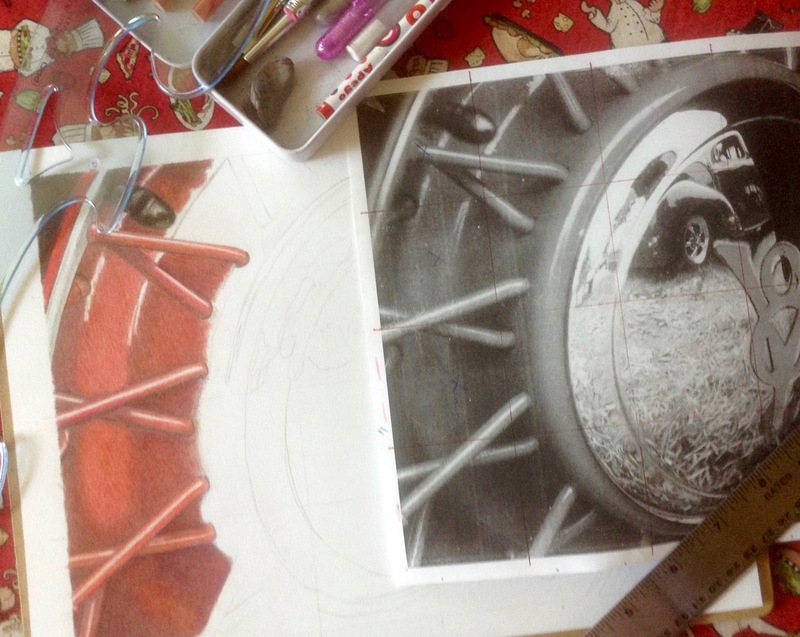 The reflection in the hubcap of “Red Car” is pretty detailed…in fact, it shows the entire back end of another car! And again, there were plenty of shadows and dark ares to fill in. Seriously, what was I thinking when I thought this would be fun image to draw? Still, I kept at working on one or two squares a day and slowly but surely I made it to that final square. YAY!!!! Because of my issues with the paper, the red of “Red Car” wasn’t as RED as I’d hoped it would be. However, once I scanned the completed piece into my computer and used a bit of iPhoto magic to warm up the reds, it turned out rather striking. The third car in the series is, you guessed it, “Blue Car.” The very first couple of squares are entirely grill work. Very detailed grill work. Why do I do this to myself?